The bad news is that most of us likely ate somewhere around 3 to 5 thousand calories at the Thanksgiving table and will probably indulge in thousands more between then and New Year’s Day. The good news is holidays do not mean you have to give up on getting healthy. And there’s no need to wait start your detox. While might still be in party mode, in between the weekends, you can still detox your body by setting up your strategy and sticking with it. You’ve heard it often and it is true — drinking warm or hot water first thing in the morning on an empty stomach (before coffee) can work wonders for your digestive system and more importantly – helps flush your liver. If possible, follow up your lemon water with a fresh green juice which can be a direct hit of nutrients to alkalize your body. There is great power in drinking one or two or your daily meals in the form of a nutrient dense protein shake. It will give you energy and stave off holiday weight gain so that you can enjoy a little indulging on your weekends and evenings out. This helps encourage the detoxification process by stimulating your lymphatic system and improving general circulation. Do it just before you shower. Besides lemon water and green juice, remember to drink more water every day. Hydration cannot be stressed enough during this time—consuming enough water is essential to help your liver and kidneys filter out toxins. Cut out gluten, dairy, sugar, alcohol, and caffeine – all of which can create a toxic buildup in your system. You can literally reboot your system in five to seven days by doing this but even a couple of days can help. Focus on nourishing, healthy meals that include fruits, veggies, and plant-based proteins. You may have heard of this as a simple way to get the benefits of a fast without feeling like you’re deprived of food. Eat your last meal no later than 7 p.m. in the evening and do not eat breakfast until at least 7am. This not only helps you sleep better but also can help curb appetite and raise energy. Be determined to squeeze in at least ½ of exercise a day, no matter how busy you get with work, visitors, party invitations, and holiday shopping and errands. Exercise is essential to the detox process. If you approach this post-holiday time with mindfulness, you will be able to enjoy special treats AND maintain some balance. 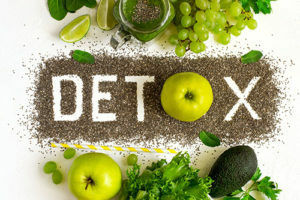 If you’d like to consider a more comprehensive detoxification program, CONTACT us at The Health Choice Compounding Pharmacy for guidance on the one that will suit you best.